Pattern Summary: Instructions are given for a variety of gauge and foot sizes. 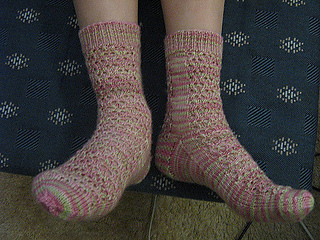 Socks can be worked top-down or toe-up on DPNs or two circular needles. Pattern Section: This pattern is in the ‘Six-Stitch Patterns with Uneven Instep and Heel Flap’ section. 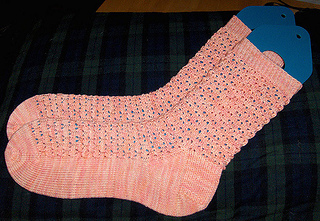 Sock pattern page 33, Stitch Pattern page 93, picture page 32.